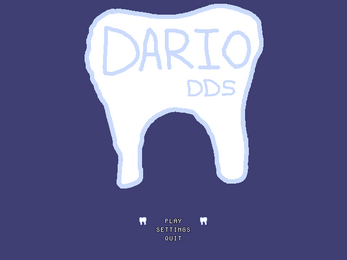 Dario is a dentist who just opened his own practice to pay off his mountain of student debt. Unfortunately, everyone in town hates the dentist and they won't come see him unless their teeth are really in bad shape. Dario has an evil idea, he will use candy to destroy everyone's teeth so they have to come see him for expensive (and PROFITABLE) implants. Help Dario match up blocks of colored candies to destroy all the teeth in town. Getting four of the same color in a row horizontally or vertically will clear the candies. Any teeth pieces adjacent to a cleared candy piece will be damaged. A tooth gets damaged first and then is destroyed. The darker teeth are already damaged. Clear all the teeth pieces to win.